The motor yacht SHINING STAR has had a cancellation and would like to offer that week at a special discounted rate. Book a full-week, 7-night all-inclusive charter September 24 - October 1, 2008, for only $9,000. That is a $5000 savings from their normal 4-person rate of $14,000. Shining Star is an air conditioned, 58-foot DeFever motor yacht, and has two guest cabins with Queen berths and ensuite heads. For those of you with a larger budget and a larger party, perhaps you'd like to consider TITAN... 30,000 euro discount for charters in September 2008. See post below, or CLICK HERE. 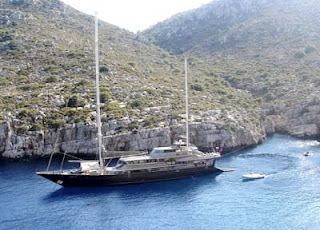 The Charter Motor Yacht TITAN, based in Genoa, is available for Western Mediterranean charters during the month of September 2008 for the special discounted rate of 230,000 euros/week (plus all expenses) rather than their normal 260,000 euro rate. TITAN accommodates up to 22 guests in 11 guest cabins and has a crew of 20. TITAN went through a major refit during this past winter and has a new interior, new blue hull, new water toys and tenders. Ask us for password, if necessary. Islander, a 46-foot Irwin staysail ketch, just wrote to us to announce that Charlie is now a certified ASA Sailing Instructor. Charlie can now certify students in basic, cruising, bareboat, and navigation. He loves teaching and he's been busy giving sailing lessons this summer in New York. Patti also mentioned that Islander's interior has been completely redecorated and that they now have an iPod/MP3 interface so guests can bring their own music and have it broadcast through Islander's sound system. We are looking forward to seeing Charlie, Patti, and BC the cat, this November in the Virgin Islands. M/S PRINCESS ZEYNEP, a 164-foot (80 meter) motorsailor which accommodates up to 24 guests in 11 guest cabins, will be sailing across the Atlantic Ocean for her 10th charter season in the Caribbean. We look forward to visiting her at the Antigua Charter Yacht show this December and seeing the new modifications and upgrades. Princess Zeynep accommodates up to 24 guests in 11 guest cabins, all with king-size beds, 2 of which are full-width master cabins, and 5 cabins that also have an additional single berth, each cabin has mini-bar, TV/DVD/Stereo system and ensuite bathroom facilities. This suite (60m2) consists of a full-beam bedroom and an ample sitting area. The bedroom located in the front features a centerline king-size bed, sofa, marble fitted bathroom and jacuzzi. The surrounding panoramic windows offer an everyday changing seaview and each morning the guests will wake up to a new sunset. The rear section of the suite is the private saloon. It features ample lounge area, wide screen LCD TV, massage chair, library and bar. Wide windows allow plenty of light and panoramic day time view. The former sections of the yacht went through a detailed renovation as well. Most cabins are refurbished keeping the elegant, classical style of the yacht. Ultimate luxury, pure comfort and complete privacy... they all come together aboard PRINCESS ZEYNEP. Captain Metin Karaman and his excellent crew are looking forward to welcoming you on board for an unforgettable cruise in the Caribbean. Enjoy a yachting vacation aboard the new 54-foot catamaran motor yacht, Eagle Ray, a Stealth 540. This high-performance power yacht can reach a top speed of 50MPH and easilty cruises at 42MPH. At cruising speed, the Stealth 540 burns 30% less fuel than other motor yachts in her class! EAGLE RAY is fully air conditioned and accommodates up to 6 guests in 3 cabins, each with ensuite heads. The Stealth 540 is 54 feet long and has an 18-foot wide beam. The full-width forward master cabin has a king berth, plus a flat screen TV with DVD, while the other two guest cabins have queen berths. Stealth yachts are specifically designed with a HYSUCAT (Hydrofoil Supported Catamaran) hull to achieve unmatched performance, fuel economy, and a superior ride in any sea conditions. EAGLE RAY offers "Captain Only" charters which means that during the charter you would be responsible for any provisioning and cooking your meals onboard and the running costs of the yacht, while the captain is responsible for the safe operation of the vessel and tender. Remember 10% off the above rates if you book before the end of September 2008!!! Eagle Ray also offers 3-night weekend rates, special mid-week rates, 2-night charters, day trips, and sunset cruises. INQUIRE! EAGLE RAY IS CURRENTLY AVAILABLE FOR CHRISTMAS AND NEW YEARS! 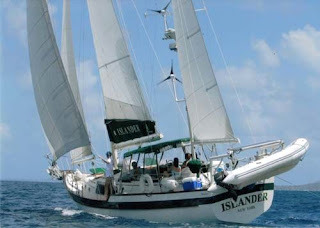 Sail the Grenadines this fall aboard the 58-foot, 10-passenger catamaran YES DEAR and SAVE!!! 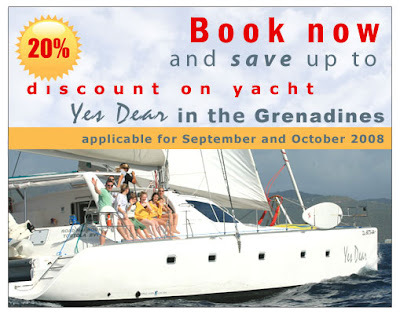 Save 20% on charters aboard the Catamaran Yes Dear taking place during the months of September and October 2008 in the Grenadines. 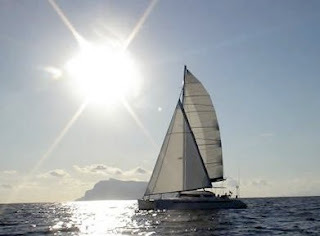 The luxury crewed catamaran BLUE NOTE is available for charter in the Balearics from September 12th through 30th, 2008. BLUE NOTE is a 56-foot Marquise catamaran with a crew of two, Captain Cayman and Chef Fiona. Besides creating suberb meals, Fiona is a fully certified dive instructor. 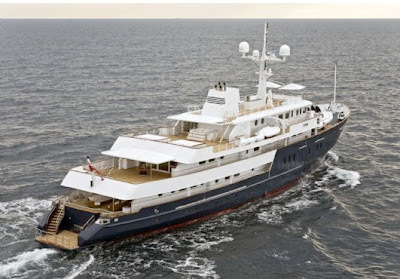 DREAM SEEKER, a 139-foot Feadship, is offering the “Dreamy” Rate of $55,000/week, plus expenses for the entire month of October 2008 with No Delivery Fee to/from Nassau! Dream Seeker accommodates up to 11 guests in 5 cabins, and has a crew of eight. EL JEFE is a 115' Derektor Tri-Deck Motor Yacht and accommodates up to 10 guests in 4 staterooms. 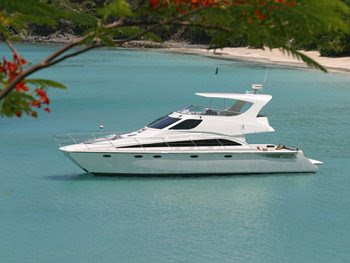 Explore all that St Maarten, Anguilla and St Barts have to offer with EL JEFE's all inclusive 4-night charter package. For added value, early boarding and a late departure will be considered. Fly into Princess Juliana airport in St Maarten & board EL JEFE at the Portofino Marina (five minutes from airport). 5:30 pm - Head out from the Simpson Bay Lagoon bridge and cruise to Anguilla for an overnight anchorage in Crocus Bay. After breakfast, take a short cruise and spend the morning swimming and snorkeling along the protected cliffs in Little Bay. Late morning, depart for Prickly Pear Cay for lunch and swimming. Mid-afternoon, raise anchor for a cruise to Pinel Island, French St Martin and Orient Bay for overnight anchorage. Take a morning cruise over to Tintamarre where you will drop anchor for island exploring, great snorkeling & a mud bath excursion. Mid-afternoon, cruise to Gustavia, St Barths for sightseeing & shopping and spend the night on the hook here. After breakfast, short cruise to Anse de Colombier for a day spent hiking, swimming & snorkeling with an overnight anchorage here. EL JEFE returns to St Maarten for the 9:30 am inbound bridge into Simpson Bay Lagoon and docks at Portofino Marina for guest departure. Diesel fuel for 3 hours cruising and generator(s), Gasoline for 15' Caribe tender/Personal watercraft, Chef’s Menu, Standard Ship's Bar, Non-alcoholic beverages, Landing fees for Pick up/Drop off, Unlimited use of tenders/waverunners, water toys. We have a family aboard the 65-foot trimaran PROMENADE this week and we have received some wonderful photos. 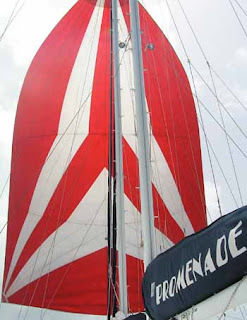 The even had the spinnaker up! 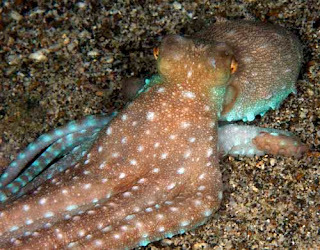 Beautiful photo of an octopus, Rich! 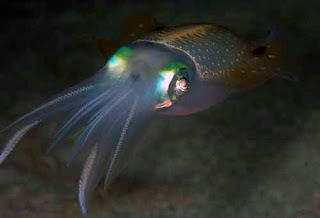 Not sure what type of fish this is but it is another great picture. 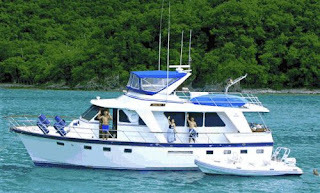 Promenade is one of our favorite and popular dive charter boats. 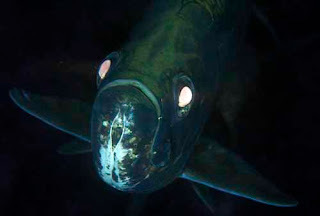 But it's OK if you don't want to dive as they are a great boat for friends and families that aren't divers. Lots of space and lots to do! If you are interested in chartering Promenade, don't hesitate. They might have a bit of summer availability (we'd have to ask Kerry) and their calendar for next season is really filling up quickly. Promenade still has cabins open for BVI Wreck Week October 26th through Nov 1st, 2008! Here are a couple of nifty things that might be good to add to a yachts "toy" arsenal... A Horse Simulator, and the BBQ Donut! Some megayachts have grand pianos, small cinemas, helipads, submarines, impressive art collections, recording studios, workout gyms, but so far I have not seen stables aboard for horseback riding. So, how about this? The £40,000 virtual reality riding machine combines a mechanical horse with a host of electronic sensors and a screen, to recreate the joys of an outdoor ride without the need for mucking out. Here's another cool item that we saw last month in the Lagoon just inside of Marigot, St. Martin: The BBQ Donut. You can just see the outboard behind the support for the beach umbrella. Perhaps you can use the umbrella as a sail. Have it be a riding sail so the "bow" of the donut is facing into the wind so the smoke from the central BBQ is always blowing "aft". Can you have a bow on a round raft??? I think this would be the perfect complement to the Sail Dive Charter Trimaran PROMENADE, whose "Power Lounger" was the hit of last November's St. Thomas Charter Yacht Show. Just raft those two babies together and you have the makings of an unforgettable party! We have just learned that the 75-foot luxury charter catamaran MATAU, is offering a 10% discount for a Venice, Italy charter for August 19-26, 2008. In September, MATAU is available in Croatia, Italy or France - depending on demand.